Located in Hunt-Parker Sanctuary and established in 2009, Bedford Audubon Society’s MAPS station marks its 10th Anniversary this summer. MAPS, which stands for Monitoring Avian Productivity and Survivorship, is a continental-wide research effort that aims to understand the causes of population changes and decline in North American landbirds. With bird populations facing increasing pressure from a multitude of threats including climate change, habitat loss, invasive species, and pollution, the data gathered from MAPS stations is critical to informing the conservation and management of North American birds and their habitats. 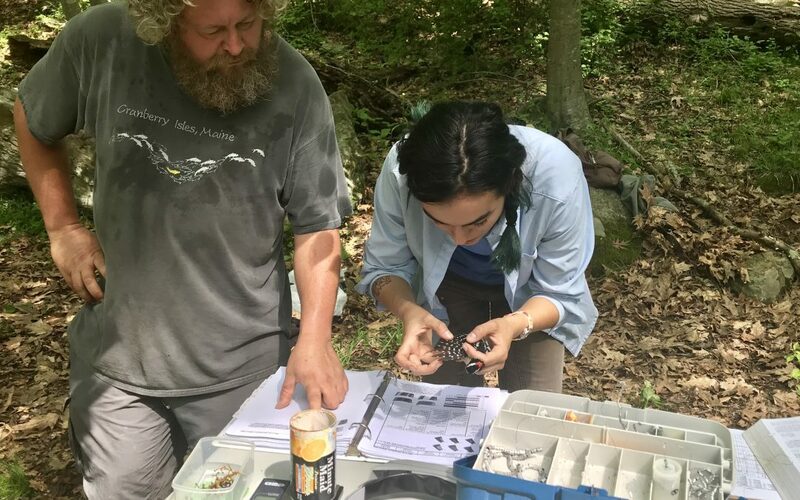 Bedford Audubon is one of many hundreds of stations operated by public agencies, NGOs, and individual bird banders that gather important monitoring data on the demography of local bird populations during the breeding season. Since its inception in 1989, the number of MAPS stations has grown dramatically from 16 stations in 1989 to more than 1,200 stations today. These stations have collected data on over 2 million individual bird captures and resulted in the publishing of over 100 peer-reviewed papers and hundreds more of reports. Where most monitoring programs estimate population size, the MAPS Program is unique in that it collects data on vital rates of birds – productivity and survival – that are used to better understand the underlying factors that drive population changes. By establishing a MAPS station, Bedford Audubon Society helps answer questions about what factors influence bird populations, when and where birds face the most stress, the relationship between climate change and habitat loss, and most importantly, what we can do to reverse population declines. The Bedford Audubon MAPS station is open to public visitors in an effort to get the community and local Audubon members involved in bird conservation. Please consider making a donation today to support conservation research and our MAPS program. Thank you for your contribution to this very important effort.